“The Greek Tobacco Epidemic” is the very apt title of a 162 page report prepared by the Faculty of the Harvard School of Public Health in collaboration with the Hellenic Ministries of Health and Education and the Hellenic Anti-Cancer Society and published in December 2011. It was funded by the George D Behrakis Foundation as part of the “Hellenic Action through research against Tobacco” (HEART) Project. I cite it in defence of what some followers thought were over-gloomy pronouncements in my earlier post on smoking. Among the multiplicity of data presented in that report are the following numbers: Diseases caused by tobacco accounted for 14.4% of the total Greek health budget, with 53 deaths a day in Greece related to smoking. Bad News indeed. However there was also some Good News: Between 2006 and 2010 the prevalence of smoking dropped by 12% in the 18-24 year age-group. The Good News was confirmed in the European Journal of Public Health in October 2012 in a paper with a less catchy title, “Prevalence and determinants of tobacco use among adults in Greece: 4-year trends”. Based on the Hellas Health III survey in 2010 it was estimated that overall 41% of Greeks (45% of men and 38% of women) were smokers. Comparing the findings with the Hellas Health I survey in 2006, in the “young adult” group there was a fall from 48% in 2006 to 35% in 2010, with “a substantial reduction in the number of cigarettes smoked in all groups”. Approaching the situation from the economic angle, a very recent publication in the British Medical Journal with another unsexy title, “Estimates of price and income elasticity in Greece. Greek debt crisis transforming cigarettes into a luxury good: an economic approach”, aimed to assess smokers’ sensitivity to cigarette price and consumer income changes, and to project health benefits of an additional tax increase. Using a statistical model the authors estimated that depending on the level of tax increase, revenue could rise while smoking could be reduced and smoking related deaths averted. Also Good News, if somewhat hypothetical. Along with increased taxation, the authors recommend that now is the time for “focused antismoking campaigns, law reinforcement (to ensure compliance with smoking bans)” but also “intensive control for smuggling”, thus keeping a one foot on either side of the fence. Concerning focused antismoking campaigns, the HEART project, introduced above, remains ever active. It is sponsoring the 6th Three-day Conference “Education for a World without Smoking”, with scientific coverage of such topics as quitting smoking, passive smoking, the electronic cigarette and contraband tobacco. It was opened on 9th December with an event for schoolchildren at the Hellenic Ministry of Education, Research and Religion by the President of Greece Prokopis Pavlopoulos, who tossed back his white mane and presented awards to the children with winning entries in the contest “I learn not to smoke”, confessing that he himself started smoking at their age and has regretted it ever since. He was recently caught on camera cadging a light off the Mayor of Thessaloniki at an official event (above). The Minister of Education, Nikos Filis, looked on with a somewhat sheepish expression, as well he might, when his colleagues in the Ministries of Economy, Development and Tourism, Citizen Protection and Mercantile Marine and Island Policy were publicly supporting the other “Stop Smoking” movement – NO to contraband cigarettes (www.oxistaparanomatsigara.gr). Yiayia was initially heartened when she opened the Sunday newspaper one weekend last month to find a full-page advertising spread dominated by a huge 100 euro note mutilated by a charred-edged cigarette burn. “At last” she thought “An antismoking campaign that will hit Greeks where it hurts – their pocket”. But she looked closer and found that the campaign was anti contraband smoking, and the hurting pockets were the state coffers. She looked even closer and found that she was being invited by 4 tobacco companies, 3 ministries, the municipalities of Athens and Thessaloniki, the Consumers’ Institute, and the Greek federations of tobacco processors, kiosk owners and agricultural cooperatives to join them in their fight against contraband cigarettes and loose tobacco. They even, helpfully, provided the telephone number for the hotline of the revenue office and its e-mail (kataggelies@sdoe.gr) for easy “κάρφωμα” (karfoma – nailing, i.e., snitching) of offenders one might happen to meet. So, in effect, the message was “DO smoke legal tobacco products and lower the country’s primary deficit”. The full extent of import and sale of untaxed tobacco products is not known. A recent government estimate put the potential gains from a crackdown on contraband at €800 million annually. 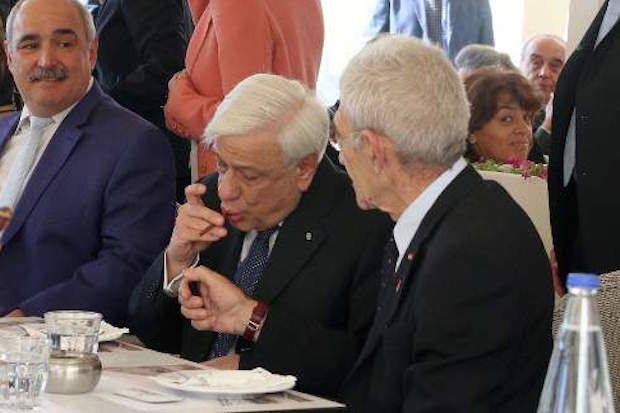 Meanwhile, many Greeks are turning to alternative smoking experiences. The increase in the numbers of smokers rolling their own cigarettes is obvious to anybody who takes a walk around. One incentive is the price – it works out cheaper – particularly if your source is contraband. Another is the impression that you cut down on consumption, which may be true, as a lot of time is taken up with all the process of opening your kit, shaking out the shreds, licking the paper, etc. ; or you cut down on risk, which is not true. Many smokers in Greece who wanted to reduce the risk have switched to “electronic cigarettes” – now one of the few growth sectors in the Greek “high street”. NOBACCO, one of the marketers of e-cigarettes in Greece, with 22 new shops in Athens, 15 throughout the rest of Greece and numerous other outlets, claims in its advertising that the “British Ministry of Health” says that e-cigarettes are 95% safer than cigarettes. Perhaps so – they don’t have the carcinogen content of cigarettes; however, their active ingredient is one of the constituents of cigarettes, nicotine, which contributes to cardiovascular damage. It is difficult to find data on legal sales figures for loose tobacco or e-cigarettes – an internet search just throws up advertising of the products. It appears, then, that a combination of antismoking legislation, albeit loosely enforced in the case of bars, coffee shops and restaurants, antismoking campaigning and economic pressures, is resulting in a reduction in smoking in Greece, with fewer young people starting and seasoned smokers cutting down, switching to e-cigarettes or rolling their own. Less revenue, but less burden on health and health costs. What is Good News for some is Bad News for others, and vice versa. Still, on the rare occasion that Yiayia decides to dine al fresco by the sea she inevitably ends up at the next table to the couple who light up between all the many dishes they order. Your article is factually incorrect when it states that nicotine is what causes cardio vascular damage in smoked tobacco. While highly addictive when smoked, nicotine is relatively harmless in the dosages found in e-cigarettes, nicotine replacement medications and even tobacco cigarettes. It is the other constituents in cigarette smoke which cause the health harms, including those to the heart. Smokers therefore can reduce the harms of their nicotine consumption significantly by quitting smoking tobacco and switching to the electronic alternative. Yiayia, like many others of her age is delighted when somebody pays attention to her words, even when she makes a slip. In the my post with reference to the use of e-cigarettes and their nicotine content, nicotine should have been described as “one of the constituents” of cigarettes that causes cardiovascular disease, as it is true that other constituents of tobacco smoke, including polycyclic aromatic hydrocarbons and oxidizing agents also damage the arteries. The post has been corrected accordingly. It should be clear from this my earlier post “Off Agenda: where have all the ashtrays gone?” that Yiayia welcomes every attempt to curtail cigarette smoking, including various forms of nicotine replacement therapy. But in our enthusiasm to cut down on tobacco products, the dangers of nicotine itself should not be underestimated. Apart from being highly addictive, there is plenty of evidence that nicotine contributes to atherosclerosis, the blockage of arteries that causes a variety of problems, depending on the organ (including the heart) to which the blood supply is impaired. See for example such articles as Nicotine and pathological angiogenesis (Life Sciences 27 November 2012, Vol.91 (21):1058-1064), or Cholinergic modulation of angiogenesis. Role of the 7 nicotinic aetylcholine receptor (Journal of Cellular Biology 108, 2, 1 October 2009: 433-446). Alternatively, for more easy reading Is Nicotine All Bad? in Scientific American (May 19 2015), which, incidentally quotes a 90% reduction in the health risk by a change to e-cigarettes, rather than the 95% mentioned in the earlier post. Or It’s not the Smoke it’s the Nicotine: E-cigarettes may damage arteries in Medical Daily (19 December 2013). Even the United States NIH, which approved a short-term period of 12 weeks for use of nicotine replacement therapy as “safe and effective in tobacco cessation”, voiced grave reservations on its use for longer periods as there is “little clinical data on the safety and efficacy of long-term use of nicotine replacement therapies” (Atherosclerosis 2011 Apr. 215 (2): 281-283).